10" Freestyle - Sport - Sold Out! 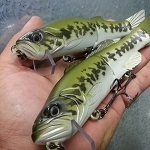 7.5" Wake Jr. - SOLD OUT! 7.5" Baby Bass - SOLD OUT! Your Price: Pre-Order Closed. We will announce delivery soon.